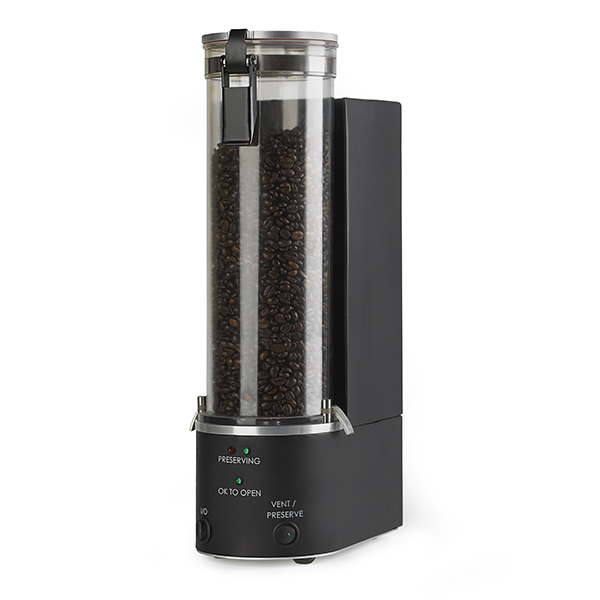 The Coffee Freshness System preserves coffee beans or grounds in a detachable, airtight storage canister using pressurized CO2 gas. The system can either be used with a single canister that remains mounted on the control assembly or with multiple canisters that can be detached and stored under pressure after the preservation cycle. This model includes a bulkhead design that allows the system to interface with an external CO2 gas tank (tank and regulator not included) resulting in an overall lower cost of ownership than the standard version which utilizes an integrated CO2 gas tank. 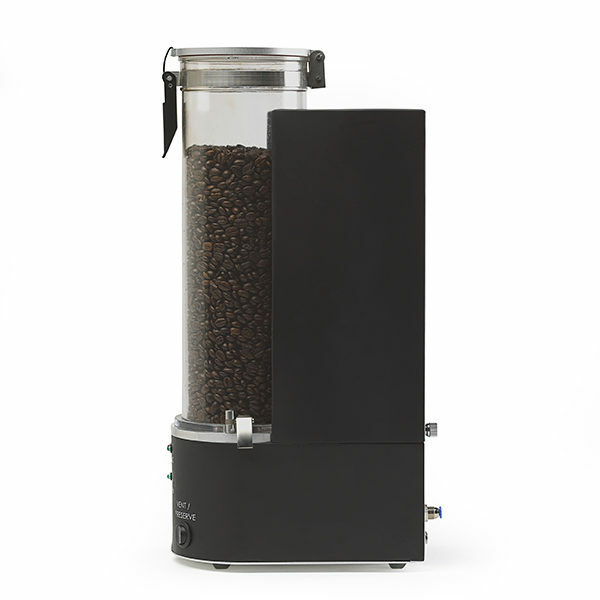 The Coffee Freshness System preserves roasted coffee beans or grounds by storing them in an environment of pressurized carbon dioxide gas where most of the atmospheric oxygen and moisture has been removed. The main components of the system are the control assembly and the airtight storage canisters. 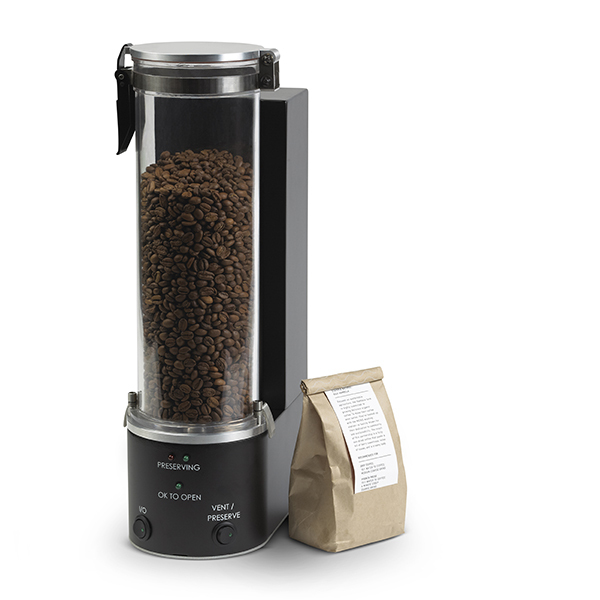 The canisters hold coffee beans or grounds and can be installed and removed from the control assembly whether they are pressurized or not. 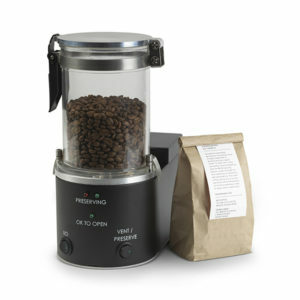 This allows for use of multiple canisters to preserve coffee, thus the user may preserve several pounds of coffee concurrently. At the push of a button, the system runs an automated preservation procedure that pressurizes the canister with carbon dioxide gas and removes air. The canisters can be opened to fill or remove coffee beans or grounds, then re-sealed and re-pressurized as many times as required by the user. This model allows for connecting an external carbon dioxide gas tank to the back panel of the system. The ability to use an external gas tank allows the customer flexibility in terms of the size of gas tank to be connected to the Coffee Freshness System. By choosing a larger gas tank you will be able to extend the time that your gas supply will last, thus extending the time between gas tank changes or refills. A larger gas tank also lowers your gas costs. This model requires the customer to supply the carbon dioxide gas tank and a Gas Regulator capable of controlling to 15 psig +/-1 psig. It is recommended that the Regulator have a low pressure gauge with a 30 psig range in order to enable accurate regulator setting. It is also recommended to use a regulator that has an overpressure device in order to prevent an accidental overpressure condition of the Coffee Freshness System. 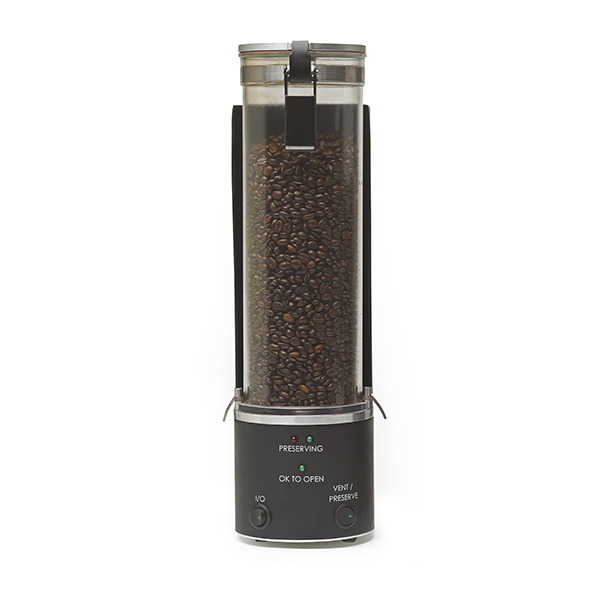 A Push-to-Connect Tube Fitting Adapter with 1/4″ NPT Male Thread and 3 feet of tubing is provided in order to connect from the Regulator to the Coffee Freshness System. This can be accomplished by removing the existing fitting from the Regulator and installing the fitting provided. See External CO2 Gas Tank Set-up in section 3.5 of the Operation and Maintenance Manual for more details. The best method for storing coffee beans or grounds.